I DO NOT HAVE CANCER ANYMORE. The disease was treated by conventional radiation therapy, and my physicians say that it has been eradicated. I believe that I have been cured, despite a recurring nightmare that a doctor is examining my body, checking for lumps. Today, I had lunch with Laura in the oak-paneled dining room of the Hay-Adams Hotel. We each had two drinks and needed more. Our love affair became a casualty of the cancer cure. Too much intensity was confined to too short a period of time, time that always seemed to be running out. Although we tried afterward, we were unable to salvage our relationship. Today, I told Laura that I am engaged to marry another woman—Diana, whom I met after the cancer experience was over. Laura and I toasted to the future—a future that we will not share. A twenty-eight-year-old writer recounts his experiences after being diagnosed as having lymphatic cancer, Hodgkin's disease, detailing the painful medical treatments and emotional adjustments of learning to live with cancer. Solkoff, Joel. 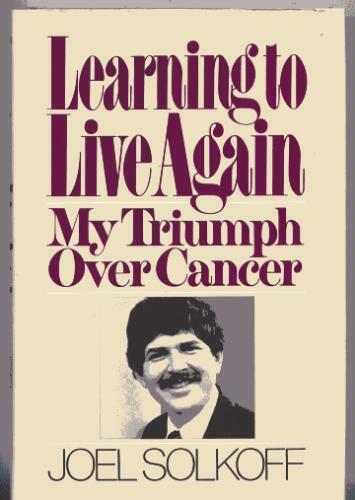 Learning To Live Again: My Triumph over Cancer. Solkoff is diagnosed as having Hodgkin's disease, a type of cancer. He fears the disease and the possibility of death. He undergoes radiation treatment to eradicate the cancer, “Radiation treatment was the worst experience of my life": he loses his appetite and his energy, and he becomes depressed. He feels humiliation, anger, and misery. Written with honesty and feeling, Learning To Live Again is a story of remarkable courage in the face of disease. Highly recommended for public library collections.